Power Quality Services | Prima Power Systems Inc.
Prima Power Systems Inc will provide an overview of harmonics and power quality and an explanation of power factor for you and your staff. 12 month hydro billing analysis can done upon request showing power factor correction calculations and estimated pay back calculations. Supply of custom designed corrective equipment. 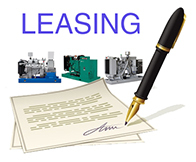 We build and/or source according to the individual facility requirements. We can also provide instruction to your staff or contractor on installation of equipment and personally commission the equipment if requested. Productive Power (Kilowatts or kW) which produces work. Reactive Power produces no productive work. Because the inductive electrical equipment employing magnetic fields requires this Reactive Power, which produces no productive work, the Total Power (kVA) provided by the generating source must be greater than the Productive Power. 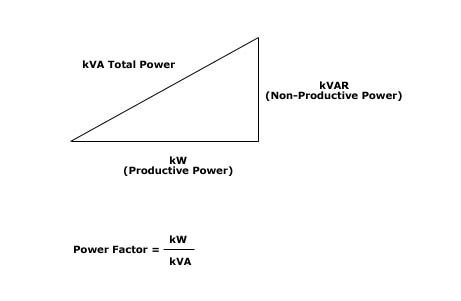 The ratio of Productive power (kW) to Total Power (kVA) is Power Factor. 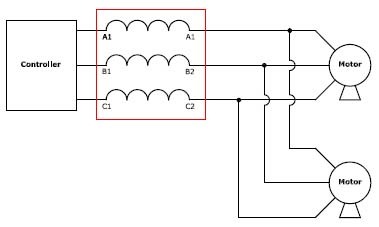 It is a measure of system electrical efficiency in an alternating current circuit, and is represented as a % or a decimal. In almost all industrial facilities where Demand charges apply, utility companies charge a penalty for poor power factor. Why Should We Improve Power Factor? To Reduce Utility Power Billing. Most, if not all Hydro Utilities charge a penalty for poor power factor. In a lot of cases this penalty can be quite substantial (20-40% of the Demand Charges plus high I2R Losses). Therefore, one of the main reasons for correcting your facilities power factor is to eliminate needless financial losses. Improving the Power Factor releases system capacity and permits additional loads (motors, lighting, etc..) to be added without overloading the system. In a typical system with a .80 P.F., only 800kW of productive power is able to be used out of 1000kVA installed. By correcting the system to unity (1.0 P.F. ), the kW = kVA. Now the corrected system will support 1000kW, versus teh 800 kW at the .80 P.F. uncorrected condition; an increase of 200kW of productive power. A good power factor (.95) provides a “stiffer” voltage, typically a 1-2% voltage rise can be expected when Power Factor is brought to +/- .95. Improving Power Factor will also lower losses in the distribution system of the facility since losses are proportional to the square of the current. Regardless of why you improve the electrical systems Power Factor it will provide a combination of all the things listed above. How do you Improve Power Factor? There are various improvements that can be made within an electrical system which will assist in the improvement of the facilities Power factor. The replacement of existing motors with more energy efficient ones; ensuring motors are properly sized for their application and duty cycle; the use of high power factor lighting ballasts; and the Installation of Power Capacitors to name a few. The installation of Power Capacitors is by far perhaps the most straight forward and most cost efficient method of improving a facilities Power Factor. Ideally, to derive the maximum benefit, properly sized static capacitor banks should be located as close as possible to the offending loads. Most times however, this may not be the most cost effective method of correction due to the sheer number of static capacitor banks that are required in a large electrical environment. A more economical method is the installation of a centrally located automatic switching power factor correction bank (APFC). This capacitor bank is controlled by a microprocessor-based relay, which continually monitors the reactive power requirements. The relay then connects or disconnects capacitors to supply capacitance as needed. Often times, we can take advantage of the use of both types of correction. Static capacitor banks can be placed at strategic locations through out facility while implementing an APFC to handle the remaining requirements for capacitance. Generally, APFCs are placed centrally at the main electrical panel. Regardless of which strategy is implemented careful planning should be undertaken to ensure maximum benefit is derived from the correction. Other factors that need to be taken into consideration during this planning phase is Harmonics on the electrical system as well as know future expansions to the facility. To best explain how Demand Billing works lets start with some real world readings and examine them as they are used by a utility when billing you. Then we will look at ways to possibly decrease the amount we have to pay for our power through the use of Power Factor Correction equipment. These are the readings that the utility will use to determine your Demand Billing. You will have to check with your local utility to determine their rate schedule, but for our example we will use $9.00/kW. A. 100% of the kW reading. B. 90% of the kVA reading. Do not be misled by the term “Billed kW” as may be listed on your utility bill. This term is used only to indicate the reading value that rates are being applied to, not whether its kW or kVA as they would have you believe. Although it seems to infer that the demand is based on kW, this number may in fact be either the kW reading or 90% of the kVA reading depending on which is largest and being used for billing purposes. Hydro One Distribution Service Rates include a monthly service charge component and a volume-based component. For Demand Billed Customers, the volume Rate is a per kW charge. The billing demand shall be taken as 90% of the kVA or 100% of the measured demand in kW, whichever is greater. For Energy Only Customers, the volume Rate is a per kWh charge. The monthly service charge component is designed to recover some common costs of Distribution Services that are independent of electricity use. All other Distribution Service costs are recovered through the volume Rate. As we can see, 135kVA is the greater number, thus rates will be applied to this reading. So, our Demand Billing (or Billed kW as it may be called) for this period would be: 135 x $9.00 = $1,215.00. Now that we know how much we are billed and on what readings we are billed lets look to see if we can reduce this cost. So what can we do to our electrical system so that rates are applied to the kW reading? The most economical way of doing this is through the installation of Power Factor Correction Capacitor Banks. Power Factor correction has been around as long as electricity has. It is the means through which we can tweak our electrical system to make it more energy efficient, and by doing so we can ensure that we are paying the least possible cost for our power. By correcting the Power Factor here to above 90% ensures that no additional expenses are being incurred. When the line voltages applied to a polyphase induction motor are not equal, unbalanced currents in the stator windings will result. 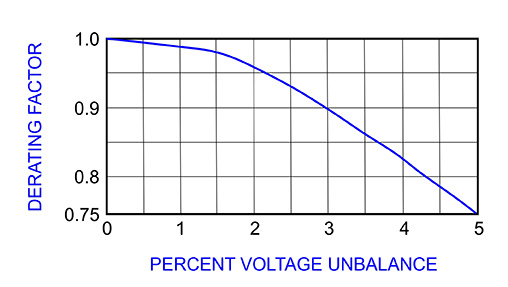 A small percentage voltage unbalance will result in a much larger percentage current unbalance. Consequently, the temperature rise of the motor operating at a particular load and percentage voltage unbalance will be greater than for the motor operating under the same conditions with balanced voltages. Should voltages be unbalanced, the rated horsepower of the motor should be multiplied by the factor shown in the graph below to reduce the possibility of damage to the motor. Operation of the motor at above a 5 per cent voltage unbalance condition is not recommended. Alternating current, polyphase motors normally are designed to operate successfully under running conditions at rated load when the voltage unbalance at the motor terminals does not exceed 1 per cent. Performance will not necessarily be the same as when the motor is operating with a balanced voltage at the motor terminals. Some users of medium voltage motors argue the fact that an optimized surge protection arrangement eliminates the risk of motor failure resulting from switching surges. The issue really is whether the cost of surge protection is economically feasible compared to the risk of motor switching surge failure. The other argument is the type of protection arrangement that should be used. The motor manufacturer cannot be expected to admit that his motors are generally susceptible to switching surges, likewise switchgear manufacturers are also unlikely to recommend surge protection for motors in the facility and remain price competitive with their products. It is therefore left to the user to decide whether or not to install surge protection. Laboratory tests can provide totally unrealistic results, particularly if high frequency circuit parameters are not realistically simulated. These guidelines for motor surge protection are based on many field tests involving actual motor installations. The objective here is to provide general guidelines concerning the application and configuration of surge protection. Protection is generally recommended for all applications where reasonable doubt exists as to the ability of a given motor to survive switching surges over it’s life span. Consideration must be given to economic factors in the sense that the cost of the surge protection does not out weigh the cost of related failures which could otherwise be expected. It is important to note that an inter-turn failure is generally associated with a localized low-energy discharge which is unlikely to cause an immediate coil-to-coil-slot failure on the motor. However, once the turn insulation has been pin-holed, subsequent switching operations may cause further breakdown at a much lower voltage. This process may be repeated over a considerable period of time before a major coil insulation failure occurs. Optimized surge protection is therefore also aimed at eliminating further failures in a coil which was previously slightly damaged, but which has not yet failed. The quality of the rewind (i.e., whether the impulse withstand voltage will be the same as for the original motor or whether the risk of a second failure will be higher. The cost of a rewind, taking into account cost differences between a “normal” rewind and a “superior” rewind, which could be quite substantial. Long term insulation degradation due to localized non-catastrophic inter-turn faults, which may eventually cause failures of several motors over a relatively long period, but which can not always be reversed once the first series of failures has drawn attention to the need for surge suppression. It is commonly accepted that surge protection should be provided in all cases, regardless of motor size, impulse withstand characteristics or switching duty. This applies to vacuum contactors, circuit breakers, and claims by manufacturers. Low switching duty i.e. typically one or two switching operations per week. If the motor is not used for essential processes. If the motor is not used for “jogging” or similar applications. Low switching duty i.e. not more than a few siwtching operations per month. If the motor is not used for essential or semi-essential processes. If the cost of a failure is relatively low compared to the cost of surge protection. These guidelines should be reviewed and consideration given to a possible installation of surge arrestors at the panel where the switching device of the motor is located. 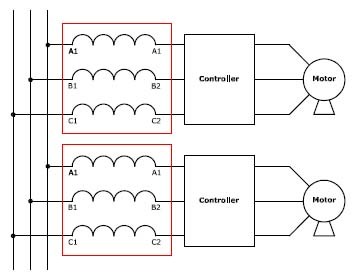 On the input of an electronic controller, line reactors protect sensitive electronic equipment from electrical noise created by the drive or inverter (notching pulsed distortion, harmonics). They also protect the controller from surges or spikes on the incoming power lines, as well as reduce harmonic distortion. They help to meet the requirements of IEEE 519. Multiple drives or inverters on a common power line require one reactor per controller. Individual reactors provide filtering between each controller (reduce crosstalk) and also provide optimum surge protection for each unit. A single reactor serving several controllers does not provide adequate protection or filtering when the system is partially loaded. The use of reactors between a controller and a motor (or other load) protects the controller from either a short circuit in the load, or a surge in output current. It accomplishes this by limiting surges. Reactors also reduce operating temperature and audible noise in motor loads. Harmonic compensation of all Guard-AC reactors allows standard units to be used here with confidence. They improve waveform integrity, thus enhancing motor performance and system efficiency. When more than one motor is controlled by a single drive, a single reactor can typically be used between the controller and the motors, as illustrated. The reactor should be sized based on the total motor/load horsepower.